dramatic. But there are still lots of scenic places for landscape photography along the coast and elsewhere. Before sunrise it was completely clear but fortunately some nice clouds moved in to bring color to Christmas morning. I made another image from the other side of the pier as well. Version #2 from the right side of the pier. Before sunrise it was completely clear but fortunately some nice clouds moved in to bring color to Christmas morning. I made another image from the other side of the pier as well. 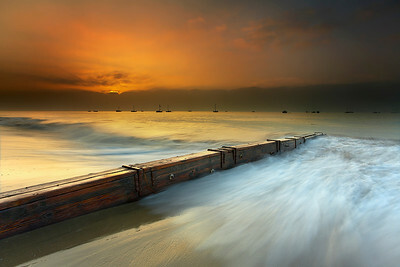 A thick fog began to clear as the sun rose, allowing the warm light to filter through to the sand. This groyne keeps the sand in place and has some good rich tones in the grain. The boats anchored offshore are there year round. 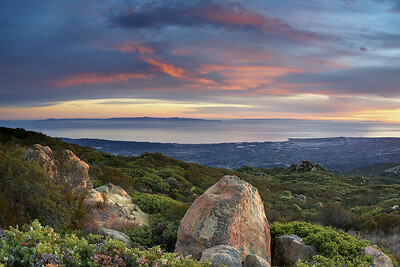 This is the view from 4,000 feet above Santa Barbara looking south towards Santa Cruz Island. Part of Channel Islands National Park. To the right is Santa Rosa island and far to the right is San Miguel Island. The Channel Islands are America's Galapagos Islands and home to the oldest dated human remains in North America—Arlington Springs Woman (13,000 BP). The world's most complete pygmy mammoth specimen was discovered on Santa Rosa Island in 1994. These miniature mammoths, only four to six feet tall, once roamed island grasslands and forests during the Pleistocene era. 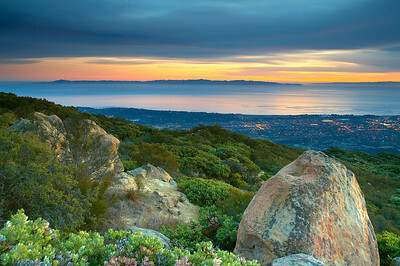 his was taken just after 'Santa Barbara Evening.' The lights of the city were getting brighter and just at the same level as the natural light. The light in the clouds illuminated the water, completing the soft mood of the moment. 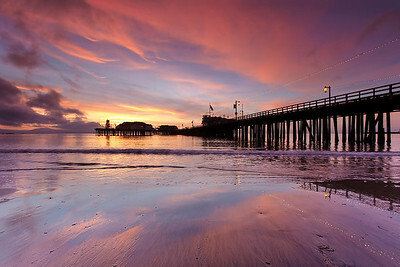 Stearns Wharf is the central attraction on the beach in Santa Barbara. There are shops and great places to eat while you take in the dramatic views of the ocean and the ridge of 4,000-foot mountains behind the city. 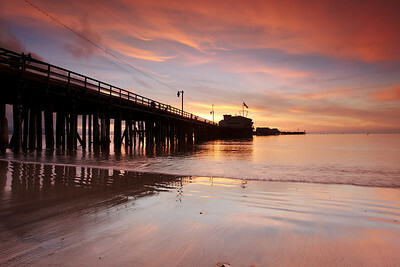 In the winter, the sun rises behind this wharf, which is the oldest working wharf in California. It took 10 trips to this pier over the course of a year before I finally made this photograph. On the other occasions, it was either completely clear (most of the time) or completely foggy. 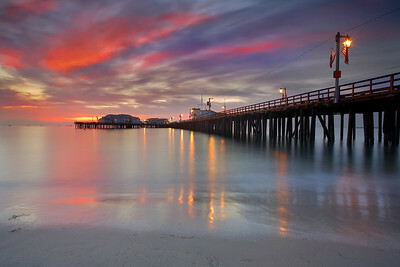 There are few places on the west coast where you can see a sunrise, but this beach faces southeast so during the winter, the sun rises behind the pier and over the ocean.